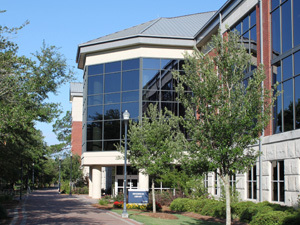 Georgia Southern University has more than 120 degree programs in eight colleges. Approximately 850 of the University’s faculty members have published peer-reviewed articles, book chapters, research studies, conference presentations and papers and more. In 2013, to showcase the breadth of research from the University faculty, staff at the University’s Zach S. Henderson Library launched DigitalCommons@GeorgiaSouthern, an open-access institutional repository powered by bepress. They added SelectedWorks, library-curated faculty profile web pages that highlight faculty articles and achievements. The University then purchased Plum™ Analytics’ PlumX™ to deliver research impact visibility and provide a number of additional benefits. For the University’s many sciences and medicine programs, PlumX tracks citations and other metrics. Humanities, which, in most universities are cited less frequently, gain the benefit of altmetrics, which help show additional interest in research outside of citations. The University’s Office of Research and Economic Development designed an Expertise Search, a searchable gateway to find Georgia Southern faculty by research interests, using the content in SelectedWorks profiles. The Expertise Search is instrumental in collaboration and recruitment. The Office of Research and Economic Development sponsors PlumX Metrics, and the Henderson Library manages the integration between PlumX Metrics and Digital Common/SelectedWorks. PlumX Metrics Plum Prints are embedded in Digital Commons and the library provides a link to each faculty member’s PlumX Profile in their SelectedWorks. PlumX collects and organizes metrics into five categories ― usage, captures, mentions, social media and citations. By integrating PlumX Metrics with Digital Commons@Georgia Southern, the institution can now showcase the impact of its faculty research. By implementing PlumX Dashboards, the library provides these metrics to stakeholders in easy-to-read graphs and reports to compare searches and sets of data. About one-third of the Georgia Southern faculty has SelectedWorks pages featuring published works. However, citation counts can take time to accumulate after a work is published, according to Ashley Lowery, Digital Collections Specialist at Henderson Library. As a result, Lowery said, it can be hard to measure a work’s impact within the first few years of publication. By integrating PlumX Dashboards with SelectedWorks, PlumX automatically created PlumX profiles from SelectedWorks profiles and now automatically updates them with any new additions. This measurement gives the Office of Research, heads of colleges, departments and faculty a view into research interest and usage that they previously never had. University staff can perform a range of searches, from an entire researcher’s career output to research published only while at Georgia Southern. They can compare usage by department, college or across the entire university’s body of research. 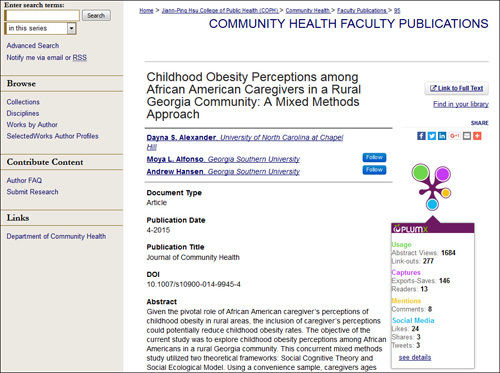 They can even conduct keyword searches on specific research to see the altmetrics for each piece. Lowery commented that after she created reports from PlumX Dashboards showing the interest in research performed by each of the colleges, faculty administration from select colleges requested presentations on PlumX Metrics and requested that the library create SelectedWorks and PlumX Metrics profiles for their faculty. With PlumX Metrics, visitors to DigitalCommons@GeorgiaSouthern can browse faculty scholarship by author, research unit or department, or by programs and conferences. When visitors drill down to the article level, they see a Plum™ Print of metrics for the article, revealing the current and cumulative interest in the research. Users can select an author and view the author’s complete PlumX profile. 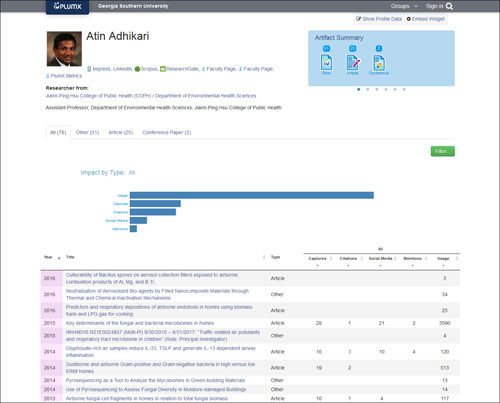 These profiles reside in the PlumX Dashboards product and show research impact by type. A bar graph displays usage numbers, social media impressions, mentions and captures. Lowery distributes PlumX Dashboards reports to the academic deans, demonstrating individual college and departmental research output. These reports include an overview of PlumX, the number of faculty members represented in SelectedWorks, and all available collective metrics in each of the institution’s colleges. According to Lowery, PlumX data is essential to the Henderson Library’s accreditation and academic program review report, which shows academic program reviewers and accrediting bodies that the library provides adequate and appropriate services and resources. Georgia Southern uses PlumX to produce annual reports on University-sponsored conferences for its organizers. The University uses Digital Commons for conference organizers to gather materials such as presentations and papers. PlumX then provides altmetrics for these resources, including social media and usage metrics. The graphs in PlumX Metrics help conference organizers who need to demonstrate the impact of their conference in order to secure funding. “Non-traditional metrics are beneficial to new and established journals when citations are not available and/or the impact factor is needed,” Lowery said, adding that the library sends PlumX Metrics reports to journal editors when they request the ability to demonstrate the impact of the journal. Lowery pointed out that PlumX supplements the publication’s citation counts with altmetrics data that shows interest, but would likely not manifest as citation counts for a year or more.